Artist Talk: Sunday, July 15, 2018. 3pm – 4pm. 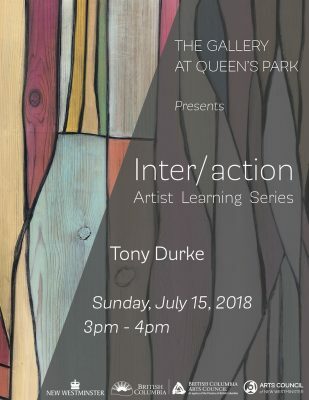 The Gallery at Queen’s Park presents Inter/action: Artist Learning Series. Inter/action is a monthly free public event that facilitates dialogue, practice, and education between the exhibiting artists and members of the community. The programming will be developed and delivered by the artists at The Gallery at Queen’s Park during their exhibition, and will consist of creative events such as artist talks, performance art, theoretical or technical seminars, live drawing/painting, collaborative social practice activities, workshops, or performances. Inter/action: Artist Learning Series encourages the integration of the arts into daily life providing fully hands-on, barrier-free, no-cost art education that promotes intergenerational mentoring opportunities and inclusivity between backgrounds of gender, race, age and ability. Tony Durke was born in Victoria BC in 1973, and grew up in Campbell River. In high school, Durke began commercial fishing, and then entered the forest industry. He later attended Canadian College in Victoria to study film arts. Duke has been working in film for 18 years, now specializing in art direction, which is a profession that involves colour, texture, and the entire design of the film. In his studio practice, Durke’s medium of choice is oil and mixed media on carved wood, and has explored this style of working for about 10 years. 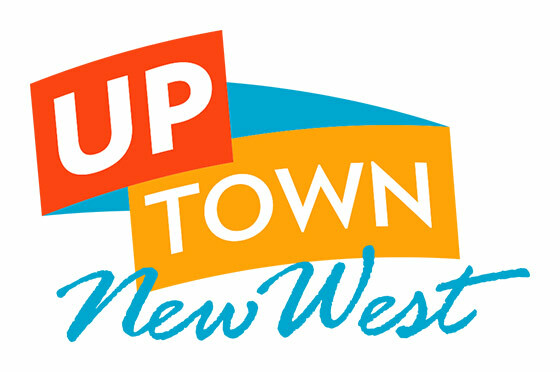 Durke now lives and works in New Westminster.